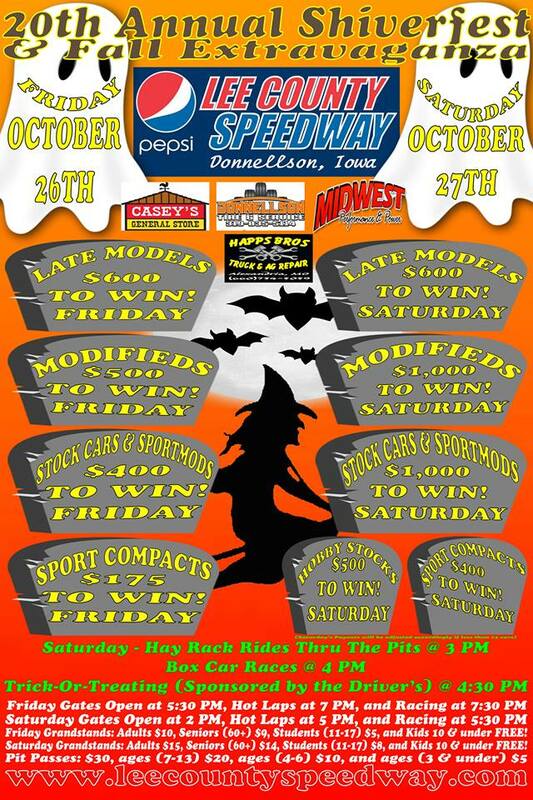 The 2018 Shiverfest / Fall Extravaganza at the Pepsi Lee County Speedway in Donnellson, Iowa, that is being presented by Casey’s General Stores, Donnellson Tire & Service, Midwest Performance & Power, and Happs Bros Truck & AG Repair, is scheduled for Friday, October 26th and Saturday, October 27th. Both nights will be a complete show and payouts, with a draw / redraw being utilize in all classes to determine the line-ups both nights. Friday, October 26th will feature racing action in the Steffes Late Models, Budweiser Modifieds, Donnellson Tire & Service Stock Cars, Discount Tire & Service SportMods, and Armstrong Tractor Sport Compacts. On Friday the Late Models will be racing for $600 to win, Modifieds going for $500 to win, the Stock Cars and SportMods for $400 to win, and the Sport Compacts for $175 to win. The is NO entry fees, registration fees, or licenses required to race on Friday night. 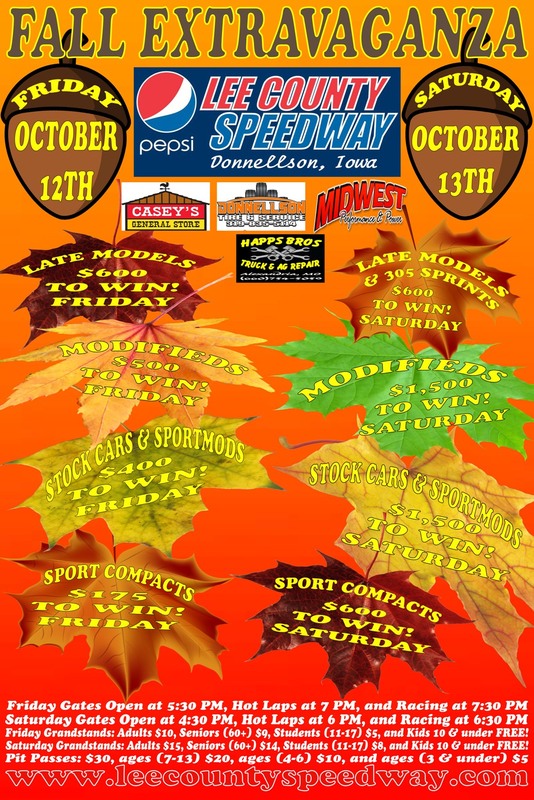 Then on Saturday, October 27th the Steffes Late Models, Budweiser Modifieds, Donnellson Tire & Service Stock Cars, Discount Tire & Service SportMods, and Armstrong Tractor Sport Compacts will return for night 2 action, with the Hobby Stocks also joining the card. The Late Models will once again be racing for $600 to win, while the Modifieds, Stock Cars and SportMods all racing for $1,000 to win, with the Sport Compacts battling for $400 to win. 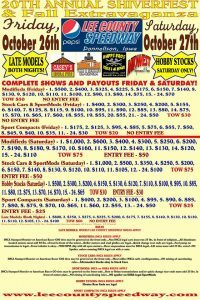 The Hobby Stocks will be going for a top prize of $500 to win. 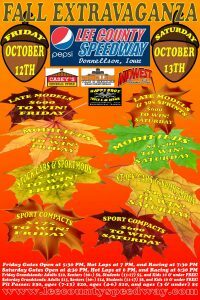 There is NO entry fees, registration fees, or licenses required for the Late Models on Saturday night. 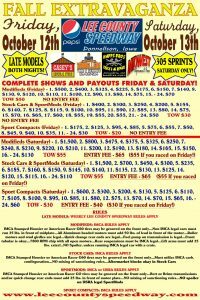 The entry fee for the Modifieds, Stock Cars, and SportMods will be $50, a $30 entry fee will be required for the Hobby Stocks, and a $25 entry fee for the Sport Compacts on Saturday. The 2018 Fall Extravaganza at the Pepsi Lee County Speedway in Donnellson, Iowa, that is being presented by Casey’s General Stores, Donnellson Tire & Service, Midwest Performance & Power, and Happs Bros Truck & AG Repair, is scheduled for Friday, October 12th and Saturday, October 13th. Both nights will be a complete show and payouts, with a draw / redraw being utilize in all classes to determine the line-ups both nights. Friday, October 12th will feature racing action in the Steffes Late Models, Budweiser Modifieds, Donnellson Tire & Service Stock Cars, Discount Tire & Service SportMods, and Armstrong Tractor Sport Compacts. 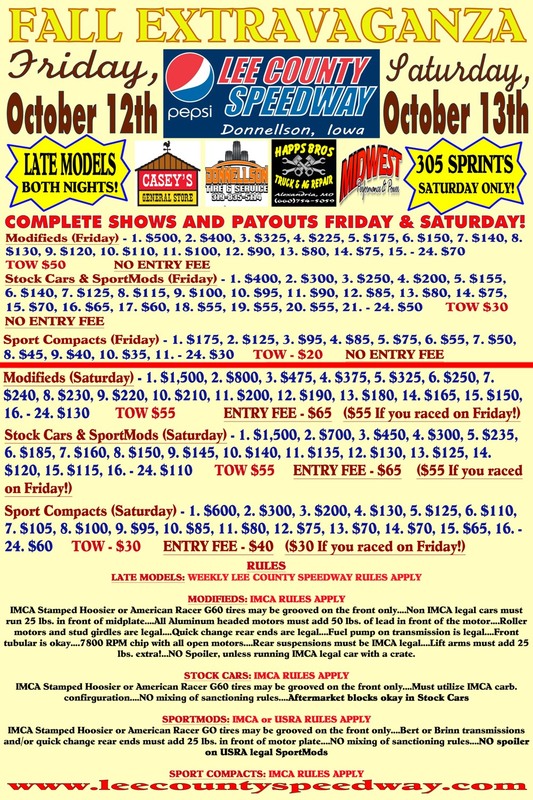 On Friday the Late Models will be racing for $600 to win, Modifieds going for $500 to win, the Stock Cars and SportMods for $400 to win, and the Sport Compacts for $175 to win. The is NO entry fees, registration fees, or licenses required to race on Friday night. Then on Saturday, October 13th the Steffes Late Models, Budweiser Modifieds, Donnellson Tire & Service Stock Cars, Discount Tire & Service SportMods, and Armstrong Tractor Sport Compacts will return for night 2 action, with the 305 Sprints also joining the card. 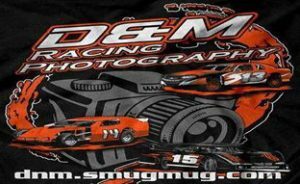 The Late Models will once again be racing for $600 to win, while the Modifieds, Stock Cars and SportMods all racing for $1,500 to win, with the Sport Compacts battling for $600 to win. The 305 Sprints will be going for a top prize of $600 to win. There is NO entry fees, registration fees, or licenses required for the Late Models or 305 Sprints on Saturday night. 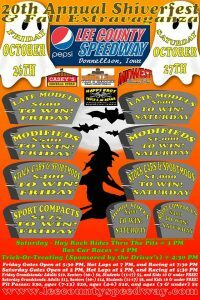 The entry fee for the Modifieds, Stock Cars, and SportMods will be $65, and a $40 entry fee will be required for the Sport Compacts on Saturday. 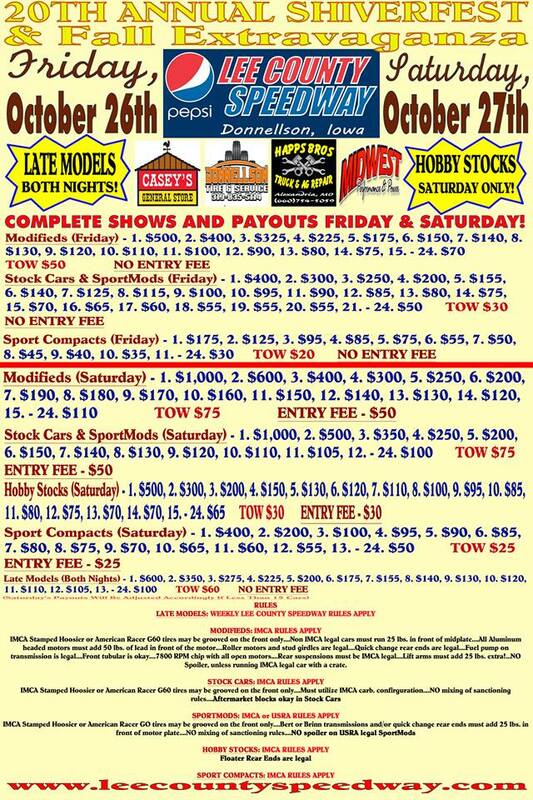 However if you raced on Friday night then the entry fees for the Modifeds, Stock Cars, and SportMods will be $55, and for the Sport Compacts it will be $30. Friday, October 12th the gates will open at 5:30 PM, with Hot Laps at 7 PM, and Racing at 7:30 PM. Grandstand admission will be Adults $10, seniors (60+) $9, students (11-17) $5, and kids 10 & under FREE! Pit passes will be $30, ages (7-13) $20, ages (4-6) $10, and ages 3 & under $5. Saturday, October 13th the gates will open at 4:30 PM, with Hot Laps at 6 PM, and Racing at 6:30 PM. Grandstand admission will be Adults $15, seniors (60+) $14, students (11-17) $8, and kids 10 & under FREE! Pit passes will be $30, ages (7-13) $20, ages (4-6) $10, and ages 3 & under $5. MODIFIEDS – IMCA Rules Apply except for the following: IMCA Stamped Hoosier or American Racer G60 tires may be grooved on the front…Non IMCA legal cars must run 25 lbs. in front of mid plate…All Aluminum headed motors must add 50 lbs. of lead on front by the motor…Roller motors and stud girdles are legal…Quick change rear ends are legal…Fuel pump on transmission is legal…Front tubular is okay…7800 RPM chip with all open motors…Rear suspension must be IMCA legal…Lift arms must add 25 lbs. extra!…NO Spoiler, unless running IMCA legal car with crate. STOCK CARS – IMCA Rules Apply with the following allowed: IMCA Stamped Hoosier or American Racer G60 tires may be grooved on the front…Must utilize IMCA carb. configuration…Aftermarket blocks are okay…NO mixing of sanctioning rules. SPORTMODS – IMCA or USRA Rules Apply with the following allowed: IMCA Stamped Hoosier or American Racer G60 tires may be grooved on the front…Bert or Brinn Transmissions and/or Quick Change rear ends must add 25 lbs. in front of motor plate…NO Spoiler on USRA legal SportMods…NO mixing of sanctioning rules. SPORT COMPACTS – IMCA Rules Apply.